پیرصاحب, مقداد, مرادی, مسعود, شرفی, کیومرث. (1394). بررسی کارایی لجن فعال با بستر ثابت مستغرق در حذف فسفر و ترکیبات نیتروژنه از فاضلاب بیمارستانی. مجله آب و فاضلاب, 26(3), 28-36. مقداد پیرصاحب; مسعود مرادی; کیومرث شرفی. "بررسی کارایی لجن فعال با بستر ثابت مستغرق در حذف فسفر و ترکیبات نیتروژنه از فاضلاب بیمارستانی". مجله آب و فاضلاب, 26, 3, 1394, 28-36. پیرصاحب, مقداد, مرادی, مسعود, شرفی, کیومرث. (1394). 'بررسی کارایی لجن فعال با بستر ثابت مستغرق در حذف فسفر و ترکیبات نیتروژنه از فاضلاب بیمارستانی', مجله آب و فاضلاب, 26(3), pp. 28-36. پیرصاحب, مقداد, مرادی, مسعود, شرفی, کیومرث. بررسی کارایی لجن فعال با بستر ثابت مستغرق در حذف فسفر و ترکیبات نیتروژنه از فاضلاب بیمارستانی. 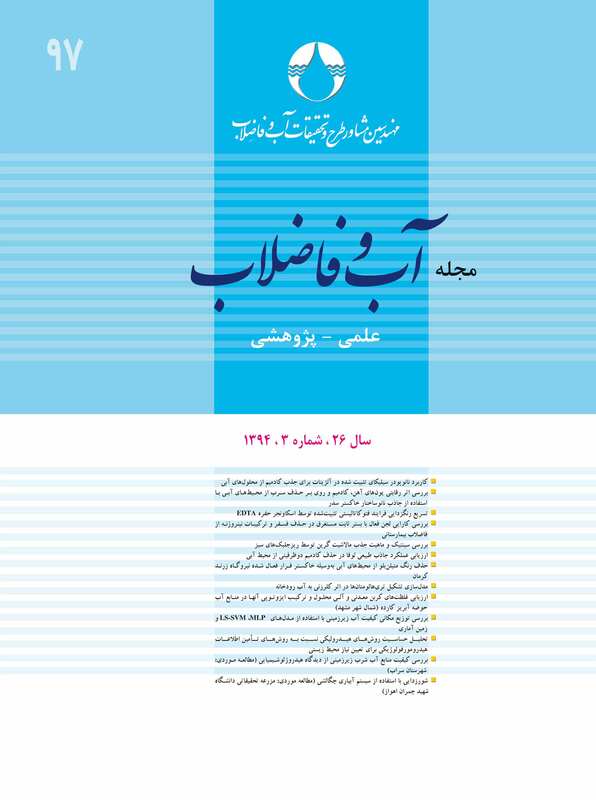 مجله آب و فاضلاب, 1394; 26(3): 28-36. فرایندهای تصفیه هوازی با رشد چسبیده ثابت، کارایی بالایی در حذف مواد آلی و فسفر و نیز انجام نیتریفیکاسیون در فاضلاب دارند. هدف از این مطالعه بررسی کارایی لجن فعال با بستر ثابت مستغرق، در حذف فسفر و ترکیبات نیتروژنه از فاضلاب بیمارستانی بود.ابتدا اقدام به ساخت راکتور، راه‌اندازی و بارگذاری سیستم لجن فعال با بستر ثابت مستغرق شد و سپس برای بررسی راندمان سیستم در حذف ازت آمونیاکی، ازت کل، نیتریت، نیترات و فسفر در سه زمان ماند مختلف یعنی 9/2ساعت هوازی و 1/1 ساعت بی‌هوازی، 6/3 ساعت هوازی و 4/1 ساعت بی‌هوازی، 4 ساعت هوازی و 5/1 ساعت بی‌هوازی، اقدام به برداشت 225 نمونه از تصفیه‌خانه فاضلاب بیمارستان فارابی کرمانشاه شد. اندازه‌گیری فسفر، نیتروژن آمونیاکی، نیتریت و نیترات به‌ترتیب طبق روش استاندارد شماره 4500-P، 4500-NH3، 4500-NO2 و 4500-NO3 انجام گرفت. بالاترین میزان درصد حذف فسفر یعنی 53 درصد، در مرحله سوم سیستم (4 ساعت هوازی و 5/1 ساعت بی‌هوازی) و بالاترین حذف ازت آمونیاکی یعنی 97 درصد و TKN 96 درصد در مرحله دوم سیستم ( 6/3 هوازی و 4/1 بی‌هوازی) بود. مقایسه میانگین راندمان حذف این پارامترها در سه زمان ماند مورد بررسی، اختلاف معنی‌داری را نشان داد (05/۰ <Pvalue).با توجه به نتایج می‌توان گفت که در صورت بهره‌برداری و نگهداری مناسب، سیستم لجن فعال رشد ثابت با بستر مستغرق، کارایی بالایی در حذف فسفر و ترکیبات نیتروژنه از فاضلاب بیمارستانی دارد. به‌طوری که زمان ماند بهینه برای حذف نیتروژن آمونیاکی، 6/3 ساعت هوازی و 4/1 ساعت بی‌هوازی و برای حذف فسفر، 4 ساعت هوازی و 5/1 ساعت بی‌هوازی برآورد شد. Aerobic treatment processes with fixed growths exhibit a high efficiency not only in the removal of organic materials and phosphorus but also in the nitrification process (conversion of ammonium to nitrate) in wastewater. The present study aims to evaluate the performance of activated sludge with a submerged fixed bed in the removal of phosphorus and nitrogen compounds from wastewater. For this purpose, a reactor was initially constructed and commissioned before the activated sludge with a submerged fixed bed was loaded. A total number of 225 samples were collected from the wastewater treatment plant at Farabi General Hospital in Kermanshah to evaluate the removal efficiency of ammonia nitrogen, total nitrogen, nitrite, nitrate, and phosphate over three different retention times (2.9 hours of aerobic and 1.1 hours of anaerobic operation; 3.6 hours ofaerobic and 1.4 hours of anaerobic operation; and 4 hours of aerobic and 1.5 hours of anaerobic operation). Phosphorus, ammonia nitrogen, nitrite, and nitrate measurements were performed according to the Standard methods 4500-P, 4500-NH3, 4500-NO2, and 4500-NO3, respectively. Results showed that the highest phosphorus removal (53%) was achieved with Phase III of the system (i.e., 4 hours of aerobic plus 1.5 hours of anaerobic operation) while the highest ammonia nitrogen removal (97%) and TKN (96%) were achieved in Phase II of the system (i.e., 3.6 hours of aerobic and 1.4 hours of anaerobic operation). Significant differences (Pvalue<0.05) were observed among the mean values for the removal efficiencies of these parameters in the three retention times. The optimum time for the removal of ammonia nitrogen was estimated at 3.6 hours of aerobic and 1.4 hours of anaerobic operation and that for the removal of phosphorus was 4 hours of aerobic and 1.5 hours of anaerobic operation. Based on the results obtained, it may be claimed that the activated sludge process with the submerged fixed bed exhibits a high efficiency for the removal of phosphorus and nitrogen compounds from hospital wastewater only if the system is properly operated and maintained. Tchobanoglous, G., Burton, F.L., and Stensel, H.D. (2003). Wastewater engineering: Treatment, disposal, reuse, 4th Ed., Metcalf and Eddy Inc., McGraw-Hill, New York, 611-626. Casellas, M., Dagot, C., and Baudu, M. (2006). “Set up and assessment of a control strategy in a SBR to enhance nitrogen and phosphorus removal.” J. of Process Biochem., 41(9), 1994-2001. Gonzalez, S., Petrovic, M., and Barcelo, D. (2007). “Removal of a broad range of surfactants from municipal wastewater-comparison between membrane bioreactor and conventional activated sludge treatment.” J. of Chemosphere, 67, 335-343. Nicolella, C., Van Loosdrecht, M.C.M., and Heijnen, J.J. (2000). “Wastewater treatment with particulate biofilm reactors.” J. of. Biotechnology, 80, 1-33. Tizghadam, M., Dagot, C., and Baudu, M. (2008). “Wastewater treatment in a hybrid activated sludge baffled reactor.” J. of. Hazardous Materials, 154, 550-557. Mehrdadi, N., Azimi, A.A., Nabibidhendi, G.R., and Hooshyari, B. (2006). “Determination of design criteria of an H-IFAS reactor in comparison with an extended aeration activated sludge process.” Iran. J. of Environ. Health Sci. Eng., 3(1), 53-64. Rezaee, A., Ansari, M., Khavanin, A., Sabzali, A., and Aryan, M.M. (2005) “Hospital wastewater treatment using an integrated anaerobic aerobic fixed film bioreactor.” American J. of Environmental Sciences, 1(4), 259-263. Majlesi Nasr, M., and Yazdanbakhsh, A.R. (2008). “Study on wastewater treatment systems in hospitals of Iran.” Iran. J. Environ. Health Sci. Eng., 3, 211-215. APHA, AWWA and WPCF. (2005). Standard method for the examination of water and wastewater, 19th Ed., Washington, D.C., USA. 10. Kermani, M., Bina, B., Movahedian, H., Amin, M.M., and Nikaein, M. (2008). “Application of moving bed biofilm process for biological organics and nutrients removal from municipal wastewater.” American J. of Environmental Sciences, 4(6), 675-682. 11. Rusten, B., Hem, L., and degaard, H. (1995). “Nitrification of municipal wastewater in moving-bed biofilm reactors.” J. of Water Environ Res, 67, 75-86. 12. U.S. Environmental Protection Agency (2009). Nutrient control design manual: State of technology review report, Washington, D.C. USA. 13. Jayaraj, S.L., and Latha, P. (2009). “Upflow anaerobic and aerobic fixed bed reactor for simultaneous COD and Nitrogen removal from municipal wastewater.” 10th National Conference on Technological Trends 2009 (NCTT09), Trivandrum, Kerala, India. 14. Biplob, P., Fatihah, S., Shahrom, Z., and Ahmed, E. (2011). “Nitrogen-removal efficiency in an upflow partially packed biological aerated filter (BAF) without backwashing process.” J. of Water Reuse and Desalination, 1(1), 27-35. 16. Khorsandi, H., Movahedyan, H., Bina, B., and Farrokhzadeh, H. (2008). “Innovative anaerobic up flow sludge blanket filtration combined bioreactor for nitrogen removal from municipal wastewater.” Int. J. of Environ. Sci. Tech., 8(2), 417-424. 17. Ahmed, M., Idris, A., and Adam, A. (2007). “Combined anaerobic-aerobic system for treatment of textile wastewater.” J. of Engineering Science and Technology, 2(1), 55-69. J. of Process Biochemistry, 40(1), 177-182.